If you have found a role as a Occupational Therapist that you are interested in applying for then you will need to have completed your qualifications and relevant training. A occupational therapist provides therapy and support to people with physical problems in order to improve their pain and or mobility either from an accident, age or other physical reason. 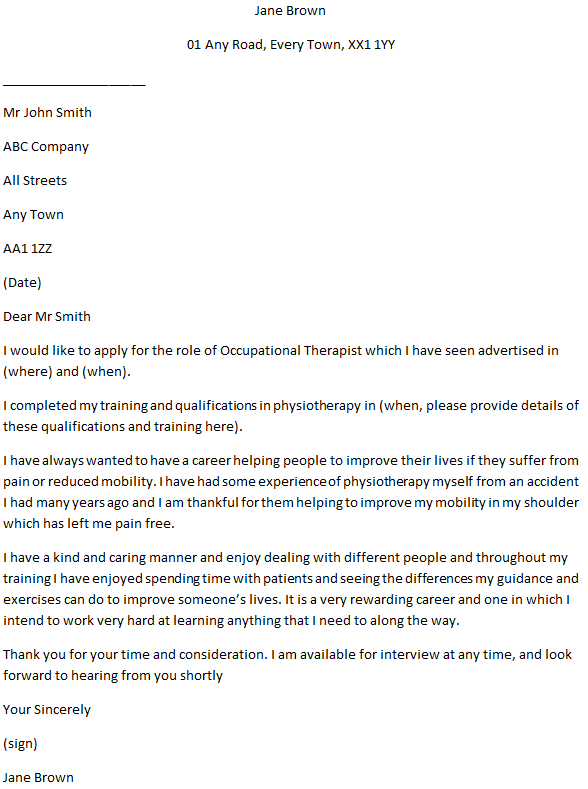 I would like to apply for the role of Occupational Therapist which I have seen advertised in (where) and (when). I completed my training and qualifications in physiotherapy in (when, please provide details of these qualifications and training here). I have always wanted to have a career helping people to improve their lives if they suffer from pain or reduced mobility. I have had some experience of physiotherapy myself from an accident I had many years ago and I am thankful for them helping to improve my mobility in my shoulder which has left me pain free. I have a kind and caring manner and enjoy dealing with different people and throughout my training I have enjoyed spending time with patients and seeing the differences my guidance and exercises can do to improve someone’s lives. It is a very rewarding career and one in which I intend to work very hard at learning anything that I need to along the way. I work in a methodical manner and research my patient’s history and background prior to their first consultation so as not to waste too much time going through paperwork when they are looking to see results. I have enclosed my up to date CV with this letter and would like to be considered for this role. I am available for an interview at short notice and would welcome the opportunity to discuss this role further with you.